Can we all agree to hate iceberg lettuce? We begin with a simple premise here at Rock City Eats. Food is subjective. Different people like different things for vastly different reasons. What we try to do is focus on the art of food and appreciate the qualities about it. Much like an art historian will appreciate at brush strokes and color palettes, we appreciate preparation techniques and food sources. There are a few things that should not be subjective, and should be used to better the food community and the food we consume as a whole. One of those things is the simple fact that iceberg lettuce is simply awful. Iceberg lettuce is the plain Lay’s potato chips of the food world. It is a checkmark. Do we have lettuce on your sandwich? Why yes we do. Do you have a side? Sure, here are some cheap potato chips. Besides having very low nutritional value, Iceberg adds no flavor, partly because it is made up of 97% water, 2.8% chloroplast, and about .2% of things that can attribute to taste. What is does however is provide a lot of crunch (again a checkmark) and makes a burger/sandwich/salad look full. I grew up as a child thinking I hated lettuce, and all greens for that matter. This was a major fallacy in my upbringing. I avoided the green leafs as though they were the worst thing in the world. Later I found that I just hated iceberg, and rather love greens and higher forms of lettuce. ButterHead Lettuce (aka Boston, Bibb, or Butter Leaf): This much more tender, sweeter lettuce variety packs a ton of flavor. If cultivated well you lose the large thick stem that runs through the middle of iceberg. This works fantastic on your sandwiches, hamburgers, and even salads. Very good universal lettuce. Spinach: A little obvious, but spinach is a far superior green for salad making. Loaded with flavors, packed with nutrients, and very versatile. This is a great go-to as a general green. 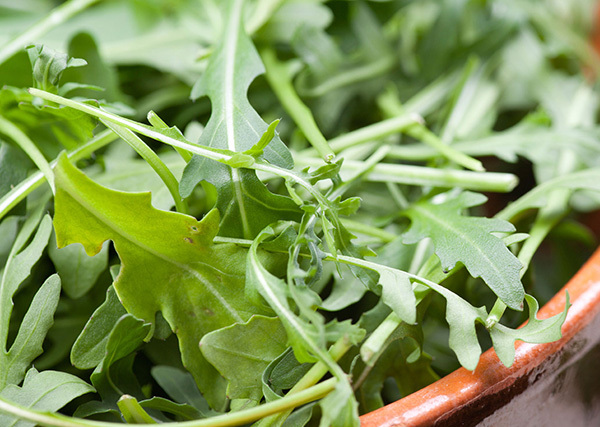 Arugula: I am not going to lie, I love Arugula. Perfect for meaty sandwiches like burgers, but also wonderful mixed with other greens in a caesar salad. Works great in non-traditional green environments such as in pastas, pizzas, and with potatoes. Kale: Kale has become increasingly popular over the last several years. It packs a very unique, bold flavor that you might love. Rumor has it (I have not tried) that it develops a slightly sweet taste when frozen and unthawed for even more versatility. Great as an addition to salads as a mixed green, but Kale is best when experimented with. Mix it in with ground meat or sausage for unique flavors, use it with stir fry beef, make Kale chips, throw it in mashed potatoes, or incorporate it into Asian dumplings. Kale almost acts like a herb in some instances by enhancing, rather than distracting, from the flavors around it. Basil: If you are like me, you probably used basil primarily as a herb most of your life. However it is growing in popularity for other uses. Mix it in with a burger for a new flavor (try it with a turkey burger), use it to wrap chicken (then deep fry naturally), use it in a wide variety of drinks (soak in water first), and my personal favorite as pesto sauce. We really need to move beyond Iceberg, do yourself a favor and cook/serve something better. All of these are available from local growers at any of your major farmer’s markets. Any other suggestions on greens/lettuce? Drop them in the comments.